Hey! This is the behind-closed-doors look at the vehicle wrap realm of Front Signs. 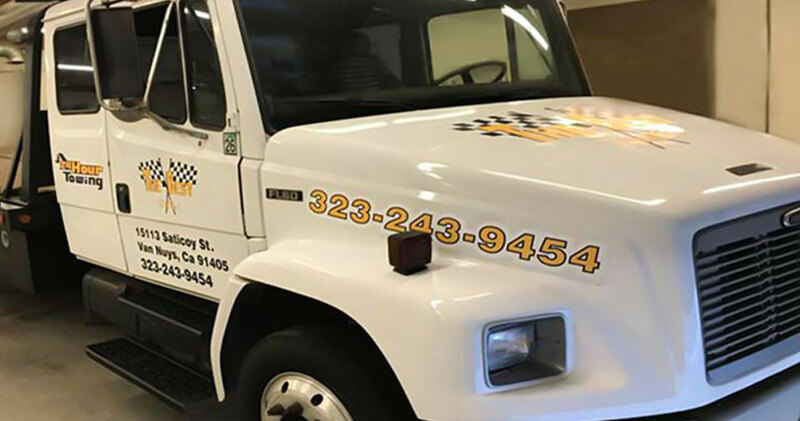 If you’re going to have your business vehicles wrapped and have some questions that haven’t found their answers yet, you’re in the right place! 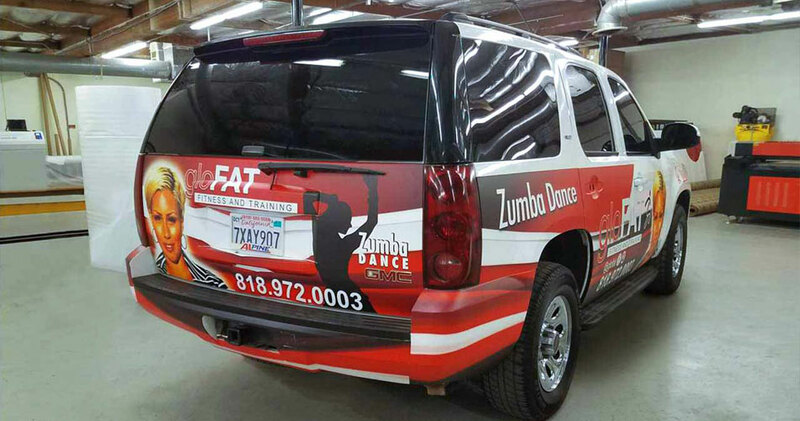 Generally, vinyl printing is another tool serving to personalize your territory, in this case, your vehicle. 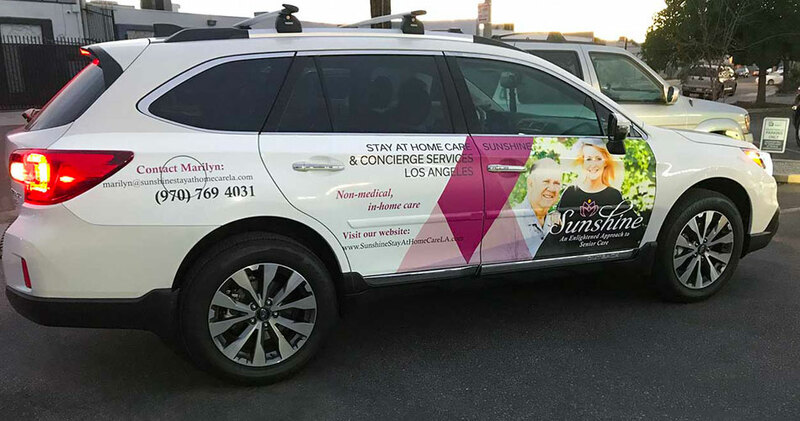 These versatile car vinyls can have different design solutions, sizes and colors to best showcase your business, personality, hobbies and message. 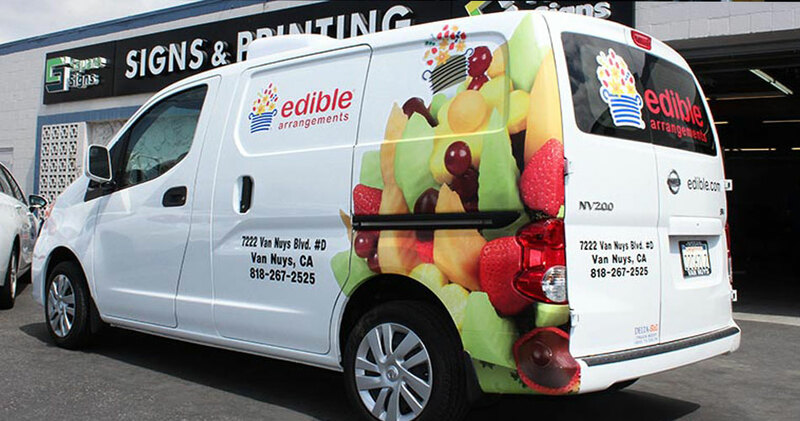 Car or vehicle advertising also known as fleet graphics is wrapping the vehicle partially or completely with vinyl adhesive that includes an advertising message on it. 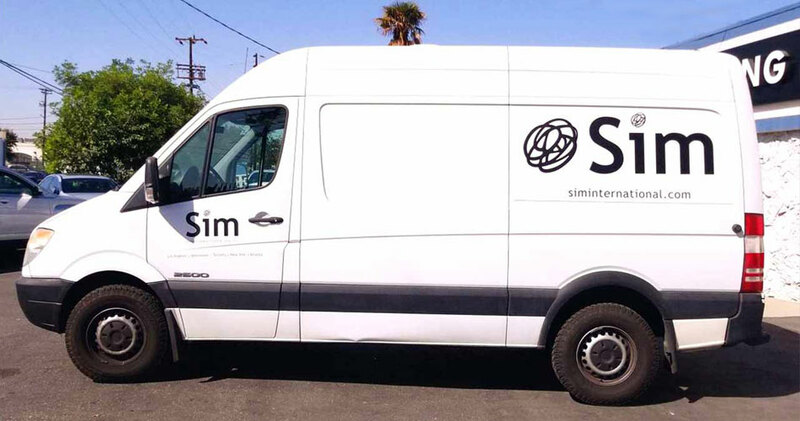 This is actually transforming the car into a mobile billboard. Car wrapping is one of the best promotional tools. Its proof can be the fact that many companies pay independent drivers to advertise their business on their personal cars. Even mobile applications were created for that purpose. 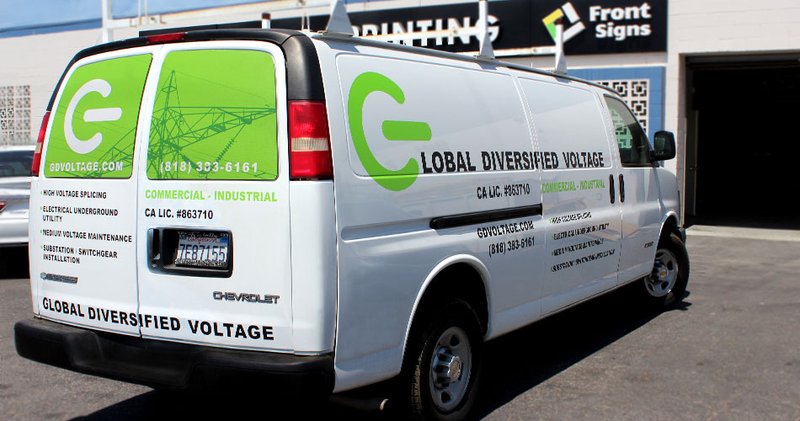 Full wraps cover the whole vehicle with attractive graphics. They give maximum information about the company showcasing not only the message that is a must (company name, logo, phone number) but also some nice design solutions, the service list, product pictures and up to the company slogan. Vinyl lettering is used when merely the company name and phone number is needed for advertisement. Well, slogans and other writing will also do. Car decals are usually smaller in size and are meant for a certain part of the car. Car hood or bonnet decals: Placing the advertisement on the front of the car will make the car noticed wherever it parks. Car side vinyl/door decals: The sides are the longest parts of the car, so more space for advertisement! You can have the car side doors wrapped identically or have different decals on different wings. Window decals: Windows can very well serve as a great advertising tool with decals applied to them. The company logo with contact information is what you will usually see on car windows. 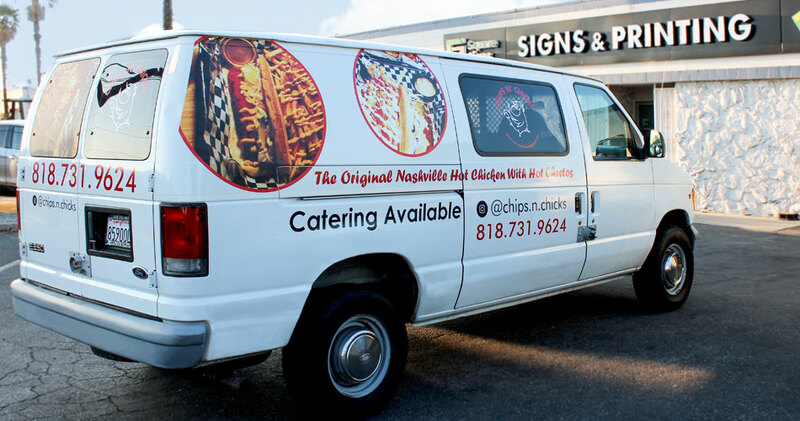 See-Through Vinyl Graphics or perforated decals are another option for car window advertising. These decals have the advertisement printed on them yet provide one way visibility from inside of the car. Tailgate decals: Tailgate decals or wraps cover the back of the car, depicting the advertising message on the tail. This gives an opportunity to be noticed by the cars driving after you. The longer you go, the more drivers know about you. Other parts of the vehicle such as mirrors, eyelids, etc. are also suitable places for decal application but are rarely used for advertising purposes. For small car decal orders feel free to contact Square Signs. They have hundreds of templates and free design tool to customize the decals to your liking. 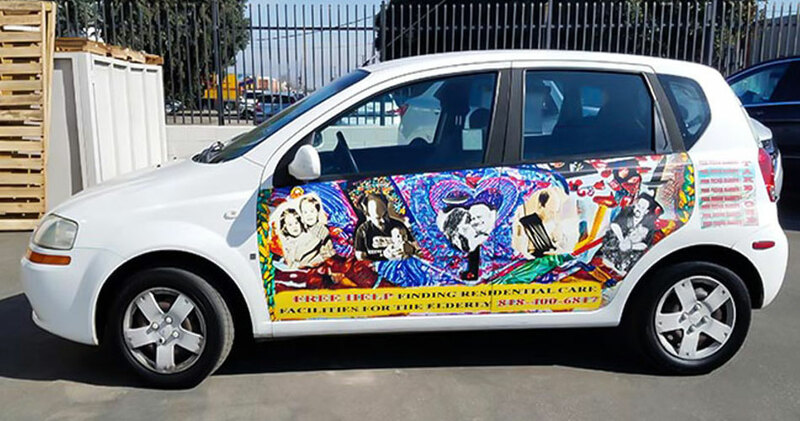 If you would like to have an advertisement on your car, but don’t want it to stay there all the time, we have a perfect solution for you – Magnet prints. You can have your company information printed on it and apply and remove from the car just whenever you don’t need it. What to include in car branding? The first four (Brand name, Logo, Services, Contact information) are a must while the others depend on your advertising campaign and goal. The company name is the main information that a customer learns about a company. It can imply what the business is about or have nothing in common with the business field, so an accompanying text about the business must follow. Here the writing “signs/printing” tells that the company is specialized in sign making and printing. If the name tells about the company, contact info directly leads the customers to you. They can take a picture of it and keep as a picture in the phone, or add as contact number. ??? ?Having an easily remembered phone number will be a big plus that will have people remember your number even when you drive by. If your company has an active website that can give sufficient information about your business activity, include it as well. This will help future customers have a better insight about your product and services and come to a decision to work with you. ◼️ Also this is another great way to drive traffic to your website, why miss it? Depending on the business orientation some attractive visuals can also be included. Companies that are specialized in design and relevant fields, have the best chance to self express them on the advertising car. An example is Edible Arrangements. 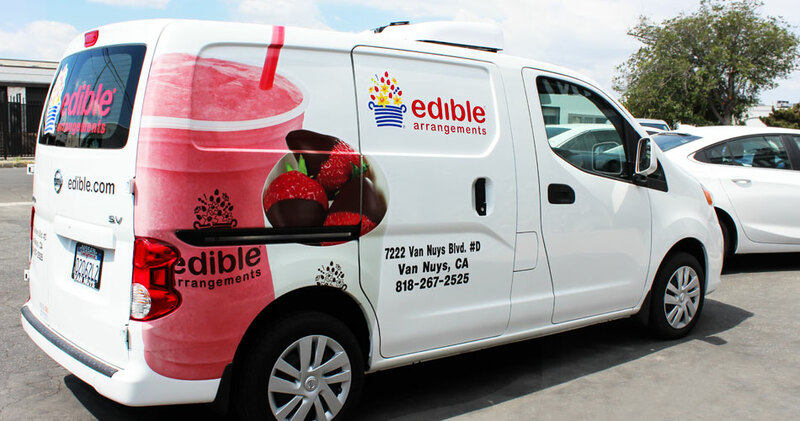 The vehicle is wrapped with food graphics vinyl that is an all-time classic. It is what’s always in trend. The juicy graphics give good vibes and feelings. Actually good design is what draws attention at first sight. If interesting, the company name and contact are noticed then. 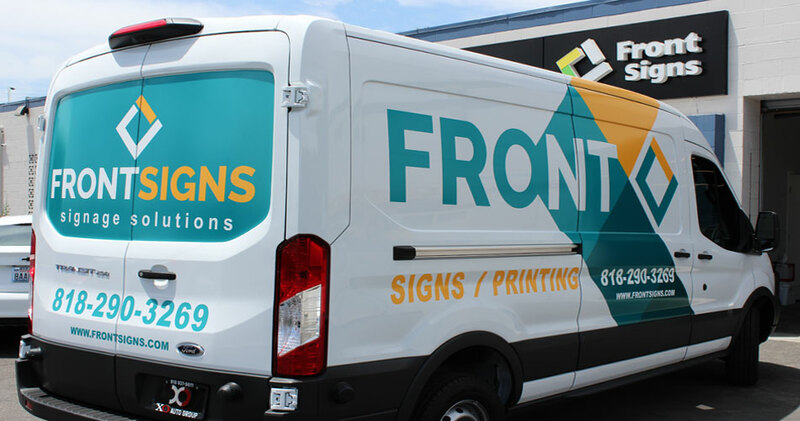 For your knowledge, Front Signs can also help you in designing your business cars with its professional designers’ team. Just let us know what you need. Slogans are an inseparable part of branding, so if you have one, include it in the car branding. This is another chance to get stuck in the customers’ mind and create a bond with them. Coming to Selling/Call to action texts let’s remember that all in all texts are what actually sell the product. Call to actions or Selling texts can lead the future customer to wanting to buy from you or use your services. The opposite can happen as well. ??? ?If your business is the kind that it doesn’t use cars, but yet you appreciate the importance of car wrapping, you can use public transportation. Just imagine how many people a day use public transport or merely see those buses in the streets of the city. Below are represented some of our partner companies we had the pleasure to work with. On the examples you can see what kind of businesses use car advertising as a part of their marketing campaign and what graphics they use. Let’s be a little immodest and start the line with our branded car. ⚫️ Front Signs is a business oriented sign making company so it will not need some crazy visuals or head turning color mixtures. For car branding our designers suggested a design that uses the logo colors – turquoise and orange. This raises calm feelings and trustworthiness in the customer towards the company. As mentioned above contact information such as phone number and website address lead the customers towards the company. While delivering products or transporting materials the car is noticed in the streets which rises brand awareness. So yes, a sign making company needs car branding! 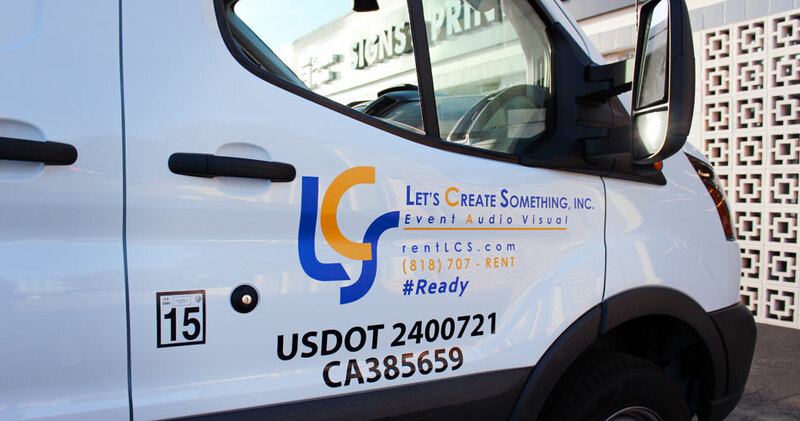 About the company: Front Signs is an L.A.-based printing & sign-making company. It is specialized in sign making, large format printing, cutting and engraving. Since its foundation the company has served over 500, 000 (half-a-million!) clients worldwide. As a matter of fact, having served that many customers means there’s almost no project within the company’s scope of expertise it hasn’t successfully pulled off. ⚫️ Little bee flowers is specialized in the decorative business – flowers, centerpieces and party favours, holiday and home decor, etc. The wrap should itself express the company orientation, as it does in this case. 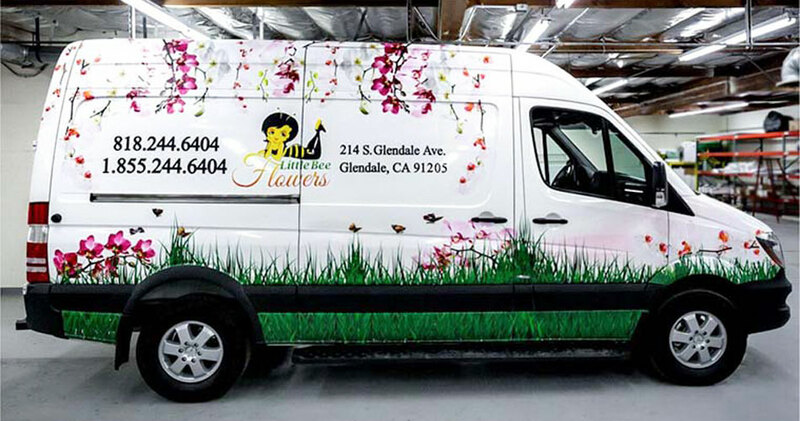 The flowers hanging from the roof of the car and the grass on the bottom help feel the freshness of the flowers that the company suggests. About the company: Little bee flowers is a company that is specialized in Home Flower Delivery, Wedding Flowers, Centerpieces and Party Favors Holiday and Home Decor. ⚫️ Edible Arrangements is a company making edible compositions. The custom car wrap contains pictures from the products with a guide where to find them (contact). The business is one of them that allows unlimited head-turning options – food is always attractive. So Edible Arrangements used that chance and depicted juicy images on the car. About the company: As the company itself says it is rooted in helping people all over the world celebrate life’s most special moments with a gift or treat. Whether it’s a birthday, a work milestone, a get-together with friends and family, or even just because their assortment of freshly made gifts is just what one needs to create spontaneous moments of goodness filled with extra sweet memories and lots of smiles! 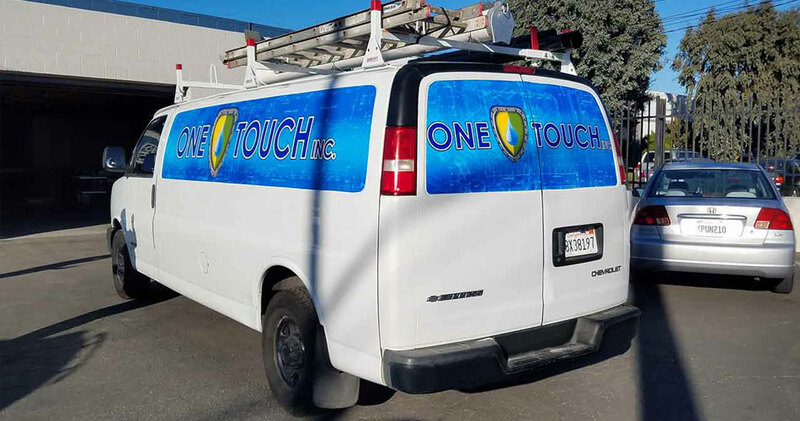 ⚫️ One Touch is a plumbing company․ Having company cars wrapped for such businesses is a sign of professionalism. This shows that the company takes it serious and treats its job with responsibility. 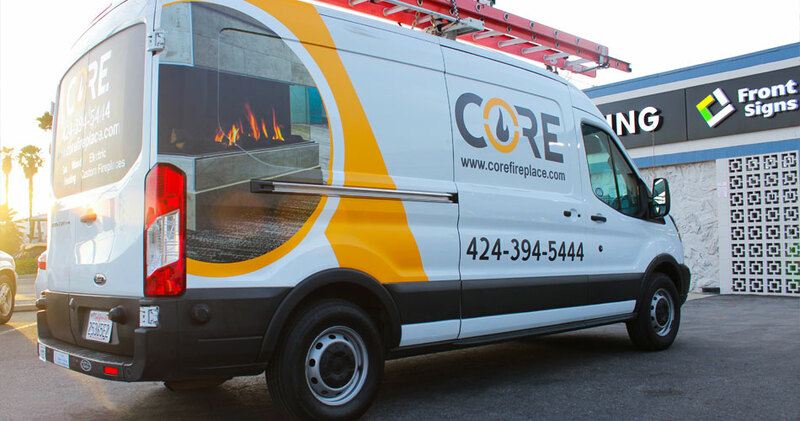 About the company: No one wants to deal with a burst pipe or clogged toilet, especially when it happens in the middle of the night or on a holiday. One Touch Plumbing & Rooter is there to help with each plumbing technician available 24 hours a day, 7 days a week. 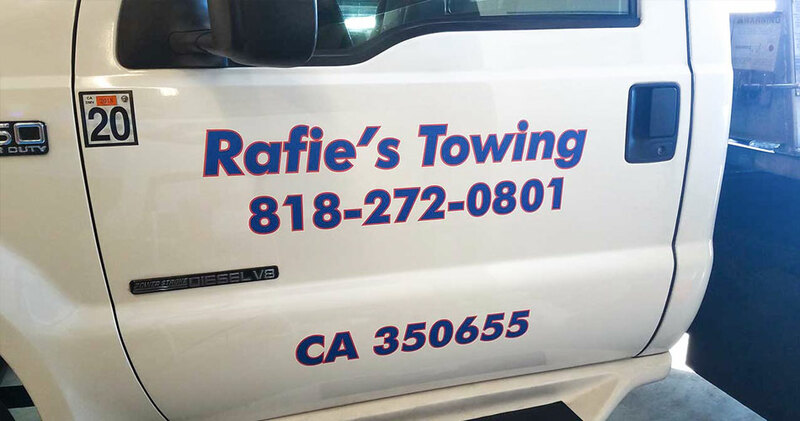 ⚫️ Rafie’s Towing is a car towing company. Cars are the very means with which the business works, so having your company data on them will be like outdoor advertising. The contact number will help passers-by to fix you at the moment and contact when needed. About the company: Rafie’s Towing suggests car towing services as well as buying and removing junk cars and trucks. ⚫️ Companies dealing with production equipment and suchlike industries use car branding to be within eye with their equipment in the production area and everywhere else. ⚫️ You give dancing lessons? Whatever it may be, don’t lose the chance to gain more participants to your lessons only wrapping your car as did Glo FAT. Maybe your future customer is sitting in the next car or passing by your car? About the company: Glo FAT Fitness and training is specialized in fitness and zumba dances. It also helps its customers lose weight or stay in shape. ⚫️ A short informative message with the name, logo and contact info are the main things that a car writing needs. Let’s Create Something, Inc. has it all. About the company: LCS specializes in technical event support to broadcasters, independent producers and corporate planners worldwide. They help at every stage of the planning. Whether pre-production planning assistance or assistance for the event day, our highly trained and experienced labor pool is needed. ??? ?And some brilliant examples without any comments and descriptions. By the way Car decals are widely used for personal use. People like a sport club, a band? They don’t want to hide it, they apply the logo sticker on the car and feel happy. You will also like the idea, give it a try!